In Roboburg, everything is getting fancier! The city's Mayor has decided that finally the time has come for every citizen to get a free upgrade! Thanks to the amazing income the theme parks provide to City Hall, all the Roboburgers received a major luxury treatment for their chassis! After this event, though, a small group of Roboburgers started calling themselves V.I.R. (Very Important Roboburgers), due to their gold and shiny new body! In Steam Park: Robots, you can exploit this "Robourgeois" to gain even more money and get away with it — but beware since these V.I.R. are picky and don't get along well with all the common Roboburgers, so you will have to make them feel special if you want them in your parks! 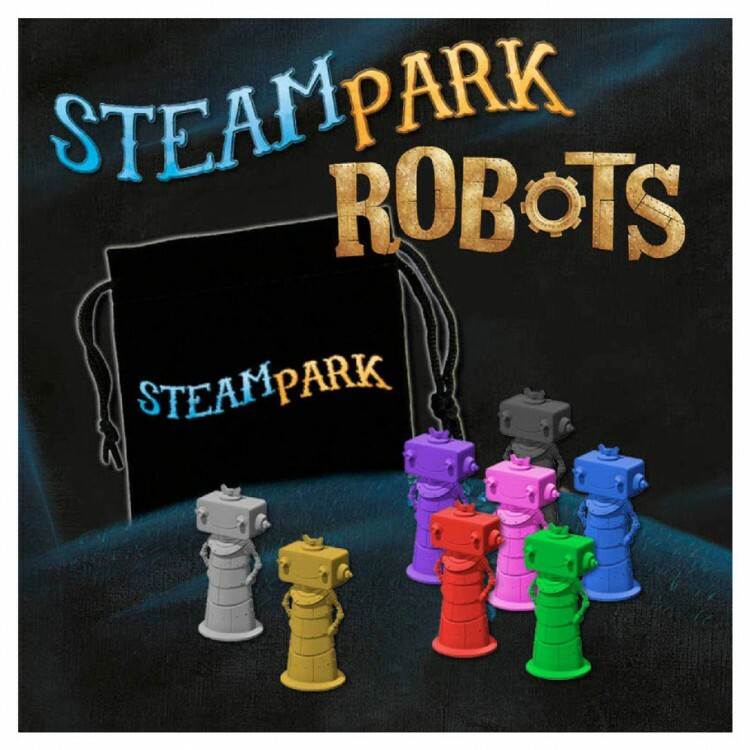 The Steam Park: Robots mini-expansion allows you to replace the wooden Roboburgers from the Steam Park base game and the Play Dirty expansion with shiny new plastic miniatures! This mini-expansion contains 56 plastic Robots and 1 embroidered bag compatible with all the other Steam Park™ products.